This Scrub-Jay emerged from the shrub, pleased with its tasty capture. I like the third one.. with wings outstreched. Wonderful photos, good job catching all the action! 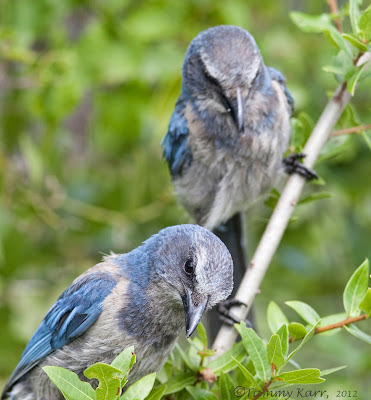 I can hardly contain my excitement at seeing these beautiful Scrub Jays. I have yet to encounter even one. Thanks for brightening my day, Tammy. Klasse Bilder von den beiden. Great series of shots Tammy, a very attractive bird. they sure are beautiful! love their dusky blues. you captured a lot of personality in these photos. 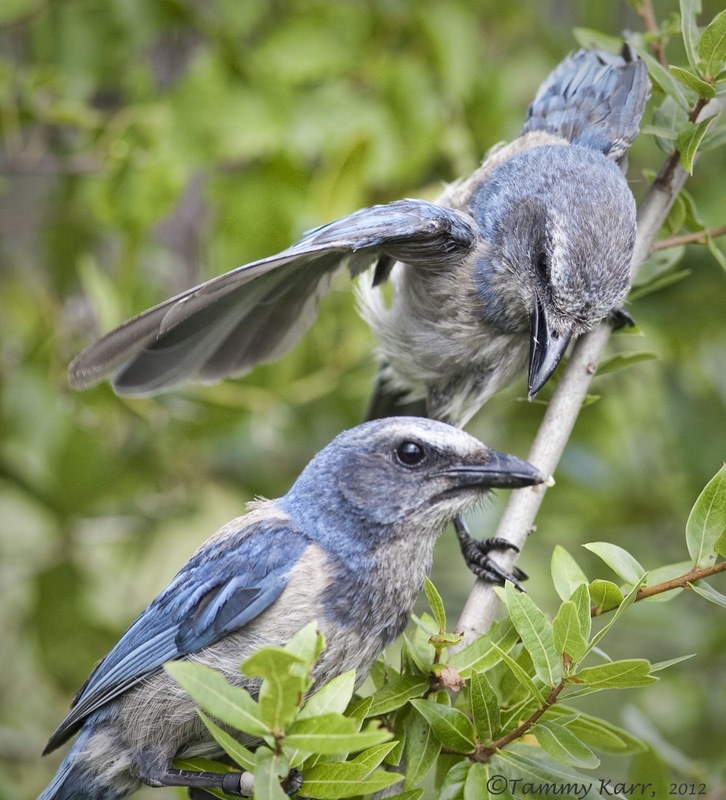 Brilliant photos of the Scrub-Jay. These are great, Tammy! I especially like the third photo! 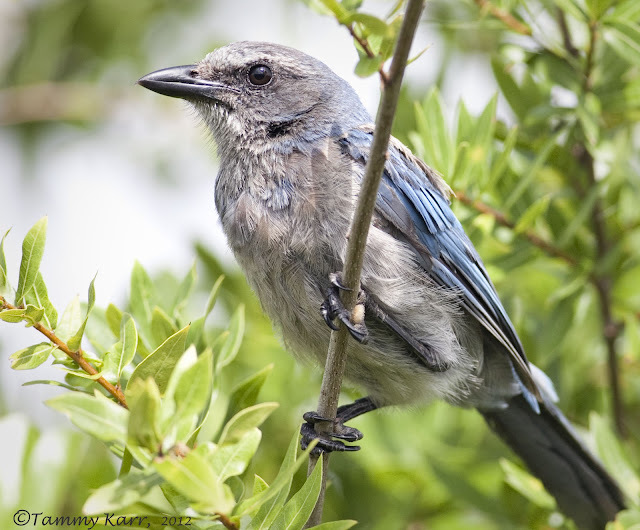 The subdued colors of the Scrub Jay are nice compared to the Blue Jay. :-) Funny series, - Charles Darwin was right, "survival of the fittest" fight for your existence. Good captures again Tammy ! Great series of beautiful photos. 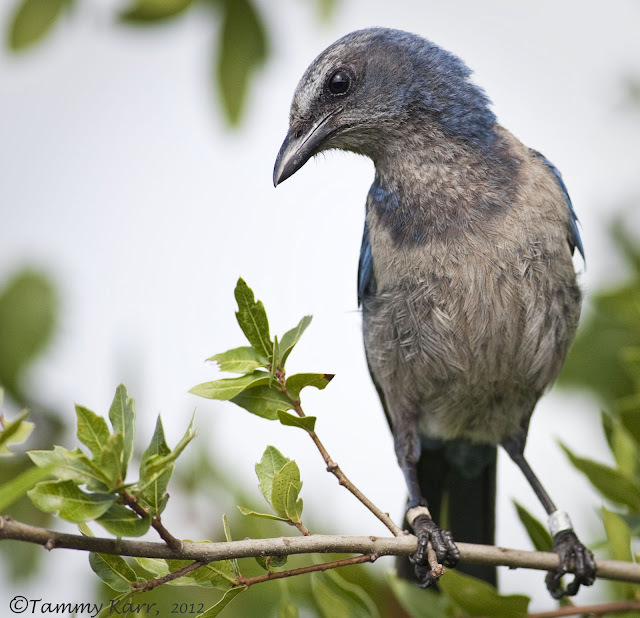 The Scrub Jay is such a beautiful bird. 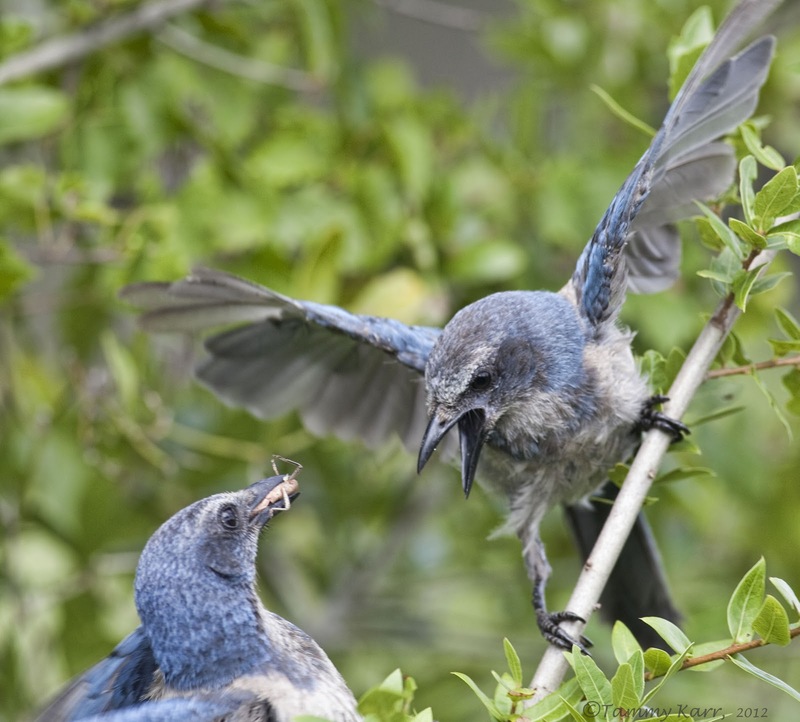 That is one angry looking Jay, saying that i would be pretty miffed if someone tried taking my food aswell. These are some pretty awesome shots. WOW!! impresionantes imágenes amiga Tammy!! Ooh, the remorseful is so touching!! Precious captures, I like them. We can often hear birds "fighting" but it's rare to see them so close as you show us! I just want to let you know that I'm very impressed of your work. I will be back to see more! Good work! Muy buenos los momentos que has captado, buenos disparos. Lovely photos of this stunning bird. Great how you've get these scenes piece by piece. Very nice to see how the other bird wants the food. Lovely shots!! 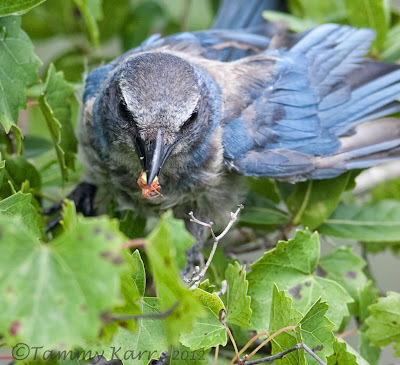 Lovely bird, great photos and a superb story Tammy. Beautiful photos and beautiful gallery ! Excellent bird and excellent photographs! I do believe you brought me good luck, Tammy. After years of not spotting a single Scrub Jay.. I finally did yesterday. It was mostly gray in color and had scruffy looking feathers.. possibly a young one. Stopping by to wish you a wonderful weekend. Lucky you to have such brilliant views of a brilliant bird(s). You have a knack for capturing behaviour and characteristics of the birds you focus (pun intended) on. Your pics are gorgeous, as usual!, and so well commented! A wonderful moment I truly enjoyed.... their characteristic mimics are fantastic ! 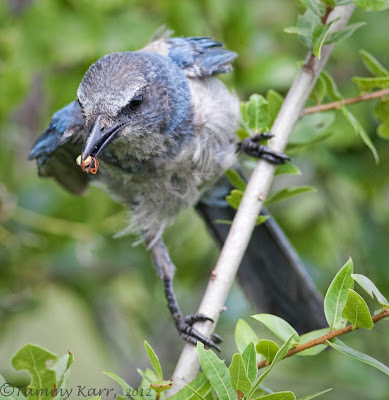 Hi Tammy, I posted photos the Scrub Jay I spotted, and I hope you don't mind me putting a link back to this post so people could see what a beauty he will become.